Acoustic Toy Museum, Virtual Sound Module from UVI. Multi-sampled in 24 bits / 96 kHz, "each instrument sounds authentic and soulful", the company assures. "Several passionate owners of musical toy collections gave us access to very rare and sometimes very old musical toys. Even a famous museum opened its doors to our insane sound design team: the Musée des Art Décoratifs, sharing the same building with one of the most famous museums in the world: the Musée du Louvre in Paris. This is a truly amazing library" said Alain Etchart, Founder and Director of Marketing at Univers Sons / Ultimate Sound Bank. Featuring the Michelsonne pianos, rare wood pianos and other keyboards. A fair amount of xylophones and metallophones, sanza, and Clavi-Harp. Simple bells, key-triggered bells, and chimes. Two small guitars and two ukuleles. Multisamples, chords and loops expertly played in various tempo and for every key, so you can play riffs in any song. From old and crispy models, to the most clean with typical tones. Presets with different samples randomly played for every note are included for the classic models. Two different drum sets, a children school one and a very cheap cardboard one. More than a dozen different percussions. Loops played by an excellent percussionnist also included. Along with the prominent melodicas, you'll find other reed instruments like accordions and harmonicas. Recorders, whistles, tiny trumpets…basically anything that can be blown into. Everything that couldn't be sorted: from the giggle stick to the puzzling boom whackers. Animated plush animals with ancient looks. Warning: you must at most be 36-month old to play with this category. Roly-poly toys, moo boxes, play centers, everything the youngests need. 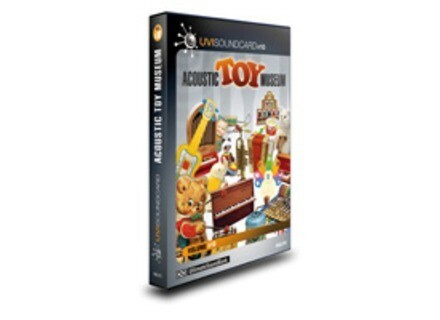 ACOUSTIC TOY MUSEUM is now available for $349, and includes the full version of UVI Workstation. 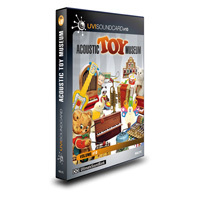 ACOUSTIC TOY MUSEUM is also available as digital download at UVI SoundSource. For more information, visit www.ultimatesoundbank.com. Freak Show Updates JambaLaya Freak Show Enterprises has updated JambaLaya to v1.3.0, which is now compatible with Mac OS X 10.6 (Snow Leopard). SKnote Skilful SKnote has announced the release of Skilful, the latest instrument in its "Attitude" series.